A conical, handmade 100% silk lampshade that will clip on to a candle lamp for wall lights and chandeliers available in twelve vibrant colours. The inner lining has a choice of two colours, white for a crisp light spread or gold for a wonderful warming hue. Please state your chosen colour of shade and lining in the special comments box at checkout or feel free to contact us for further details. Fabric swatches also available on request. 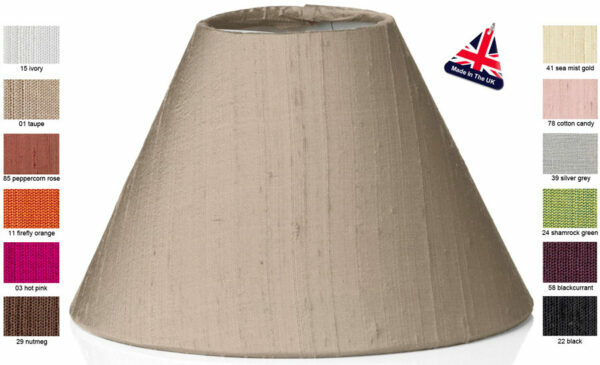 As these lampshades are handmade to order by David Hunt Lighting, please allow 2 – 4 weeks for delivery.